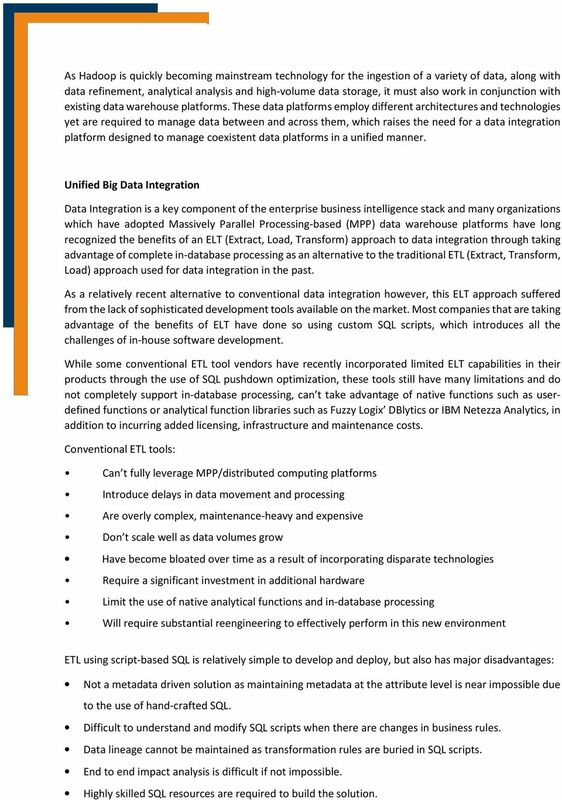 Download "Unified Data Integration Across Big Data Platforms"
2 Contents Business Problem... 2 Unified Big Data Integration... 3 Diyotta Solution Overview... 4 Data Warehouse Project Implementation using ELT... 6 Diyotta DI Suite Capabilities... 7 Benefits of the Diyotta Solution Conclusion The Business Problem In today's increasingly fast-paced business environment, organizations need to use more specialized and fit-for-purpose applications to accelerate deployment of functionality and data availability to meet rapidly changing requirements and voluminous data growth. They also need to ensure the coexistence of these applications across heterogeneous data warehouse platforms and clusters of distributed computing systems, while guaranteeing the ability to share data between all applications and systems. 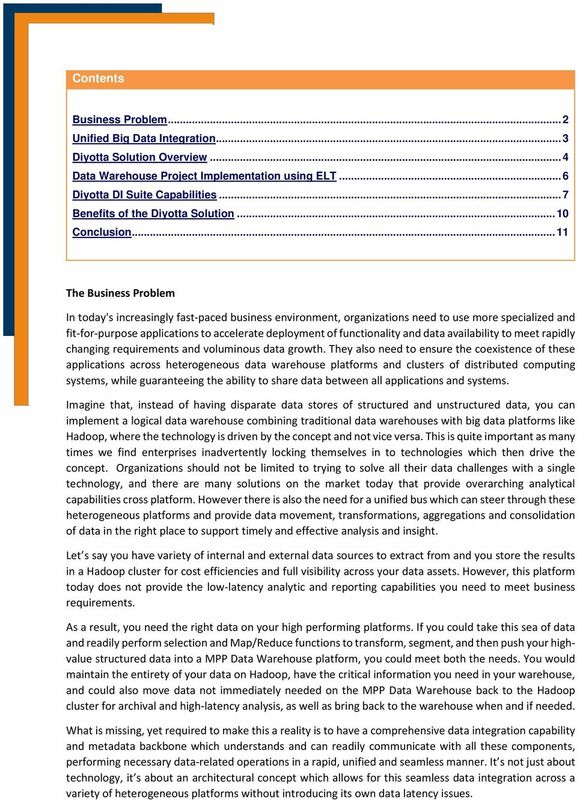 Imagine that, instead of having disparate data stores of structured and unstructured data, you can implement a logical data warehouse combining traditional data warehouses with big data platforms like Hadoop, where the technology is driven by the concept and not vice versa. This is quite important as many times we find enterprises inadvertently locking themselves in to technologies which then drive the concept. Organizations should not be limited to trying to solve all their data challenges with a single technology, and there are many solutions on the market today that provide overarching analytical capabilities cross platform. However there is also the need for a unified bus which can steer through these heterogeneous platforms and provide data movement, transformations, aggregations and consolidation of data in the right place to support timely and effective analysis and insight. Let s say you have variety of internal and external data sources to extract from and you store the results in a Hadoop cluster for cost efficiencies and full visibility across your data assets. However, this platform today does not provide the low-latency analytic and reporting capabilities you need to meet business requirements. As a result, you need the right data on your high performing platforms. If you could take this sea of data and readily perform selection and Map/Reduce functions to transform, segment, and then push your highvalue structured data into a MPP Data Warehouse platform, you could meet both the needs. You would maintain the entirety of your data on Hadoop, have the critical information you need in your warehouse, and could also move data not immediately needed on the MPP Data Warehouse back to the Hadoop cluster for archival and high-latency analysis, as well as bring back to the warehouse when and if needed. What is missing, yet required to make this a reality is to have a comprehensive data integration capability and metadata backbone which understands and can readily communicate with all these components, performing necessary data-related operations in a rapid, unified and seamless manner. It s not just about technology, it s about an architectural concept which allows for this seamless data integration across a variety of heterogeneous platforms without introducing its own data latency issues. 3 As Hadoop is quickly becoming mainstream technology for the ingestion of a variety of data, along with data refinement, analytical analysis and high-volume data storage, it must also work in conjunction with existing data warehouse platforms. These data platforms employ different architectures and technologies yet are required to manage data between and across them, which raises the need for a data integration platform designed to manage coexistent data platforms in a unified manner. Unified Big Data Integration Data Integration is a key component of the enterprise business intelligence stack and many organizations which have adopted Massively Parallel Processing-based (MPP) data warehouse platforms have long recognized the benefits of an ELT (Extract, Load, Transform) approach to data integration through taking advantage of complete in-database processing as an alternative to the traditional ETL (Extract, Transform, Load) approach used for data integration in the past. As a relatively recent alternative to conventional data integration however, this ELT approach suffered from the lack of sophisticated development tools available on the market. Most companies that are taking advantage of the benefits of ELT have done so using custom SQL scripts, which introduces all the challenges of in-house software development. While some conventional ETL tool vendors have recently incorporated limited ELT capabilities in their products through the use of SQL pushdown optimization, these tools still have many limitations and do not completely support in-database processing, can t take advantage of native functions such as userdefined functions or analytical function libraries such as Fuzzy Logix DBlytics or IBM Netezza Analytics, in addition to incurring added licensing, infrastructure and maintenance costs. Conventional ETL tools: Can t fully leverage MPP/distributed computing platforms Introduce delays in data movement and processing Are overly complex, maintenance-heavy and expensive Don t scale well as data volumes grow Have become bloated over time as a result of incorporating disparate technologies Require a significant investment in additional hardware Limit the use of native analytical functions and in-database processing Will require substantial reengineering to effectively perform in this new environment ETL using script-based SQL is relatively simple to develop and deploy, but also has major disadvantages: Not a metadata driven solution as maintaining metadata at the attribute level is near impossible due to the use of hand-crafted SQL. Difficult to understand and modify SQL scripts when there are changes in business rules. Data lineage cannot be maintained as transformation rules are buried in SQL scripts. End to end impact analysis is difficult if not impossible. Highly skilled SQL resources are required to build the solution. 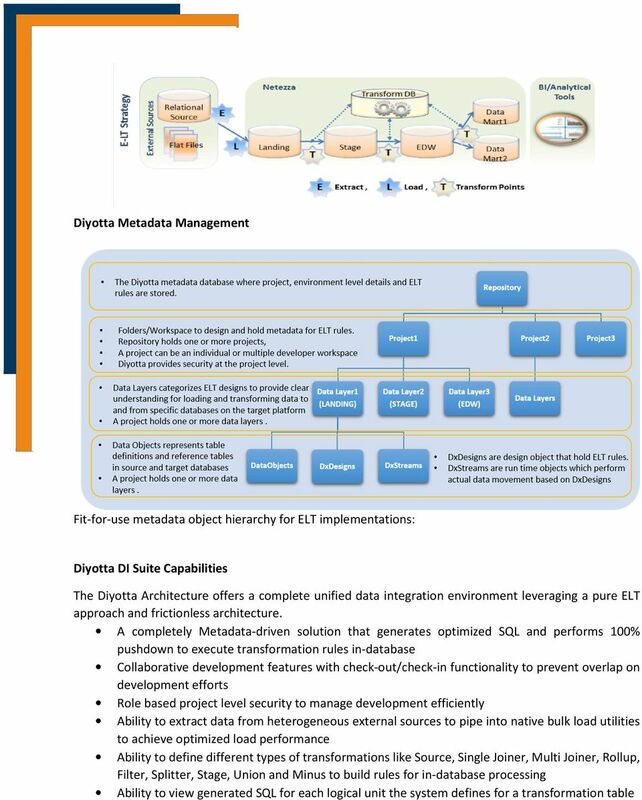 6 Diyotta Solution Overview The Diyotta Data Integration suite consists of a browser-based integrated graphical development environment which allows you to: Incorporate and configure multiple source and targets systems, create and manager users, roles and security within the ADMIN module. 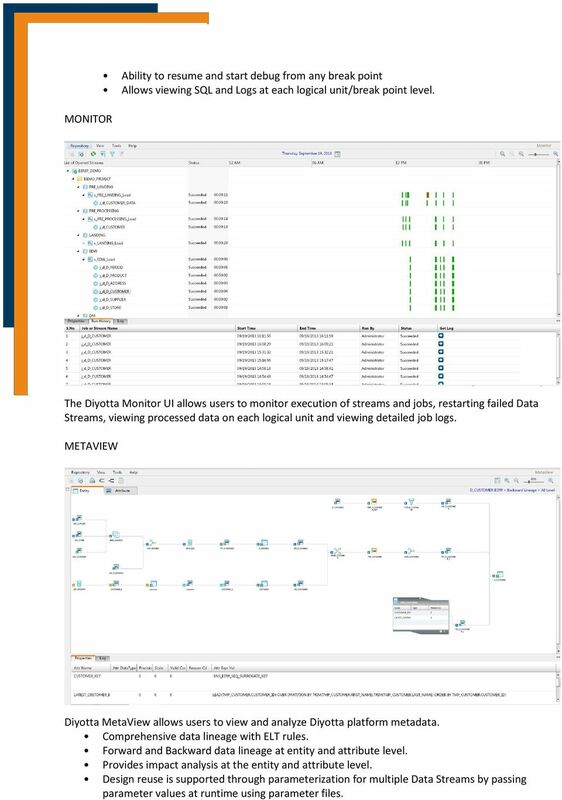 Import objects and design Data Streams across multiple platforms within the same projects using the STUDIO module Schedule, execute and monitor execution of these Data Streams via SCHEDULER and MONITOR Manage and analyze the associated metadata using METAVIEW The Integration Server provides a set of services including a rules compile engine, execution manager, scheduling manager, metadata manager and the metadata repository Data Warehouse Project Implementation using ELT Data is acquired from multiple sources and loaded into a landing area on the MPP Warehouse platform without any major change to the data. The data is then cleansed and integrated with existing data and loaded into a staging area. Additional data will be loaded into the Data Warehouse in the required format based on business rules Finally, data is aggregated with rules applied and the final results are loaded into target data marts. 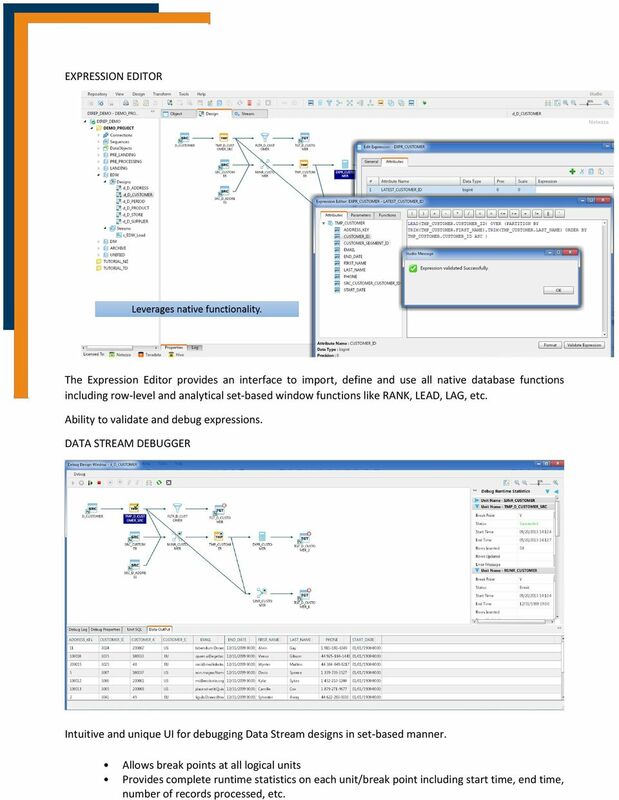 8 EXPRESSION EDITOR The Expression Editor provides an interface to import, define and use all native database functions including row-level and analytical set-based window functions like RANK, LEAD, LAG, etc. Ability to validate and debug expressions. DATA STREAM DEBUGGER Intuitive and unique UI for debugging Data Stream designs in set-based manner. Allows break points at all logical units Provides complete runtime statistics on each unit/break point including start time, end time, number of records processed, etc. 9 MONITOR Ability to resume and start debug from any break point Allows viewing SQL and Logs at each logical unit/break point level. 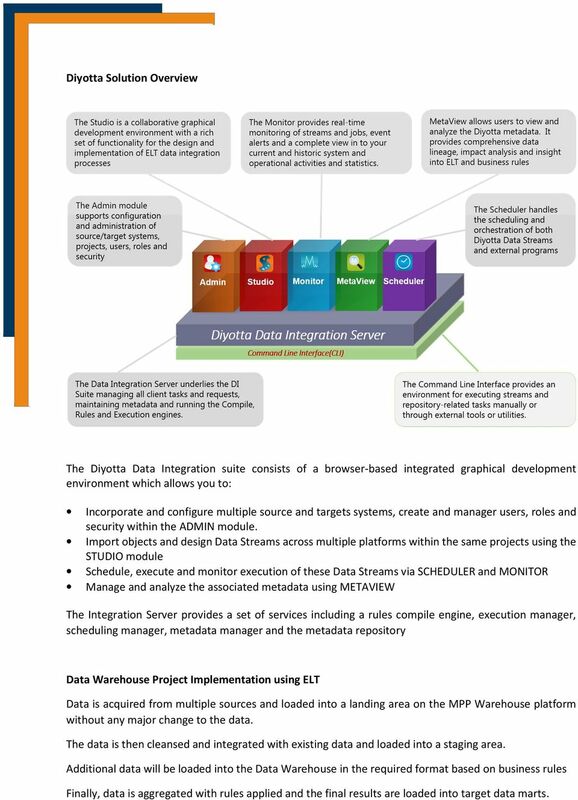 The Diyotta Monitor UI allows users to monitor execution of streams and jobs, restarting failed Data Streams, viewing processed data on each logical unit and viewing detailed job logs. 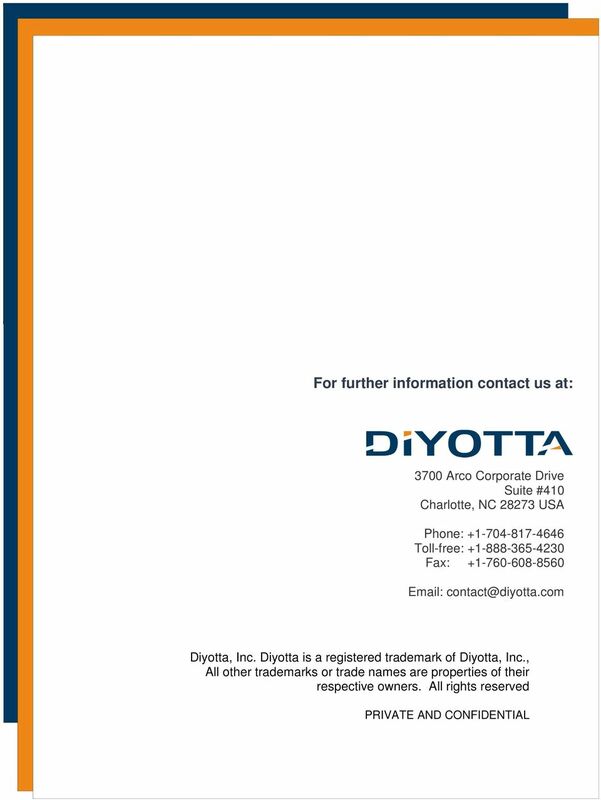 METAVIEW Diyotta MetaView allows users to view and analyze Diyotta platform metadata. Comprehensive data lineage with ELT rules. Forward and Backward data lineage at entity and attribute level. Provides impact analysis at the entity and attribute level. Design reuse is supported through parameterization for multiple Data Streams by passing parameter values at runtime using parameter files. 10 Diyotta Objects can be exported as XML and maintained in any external version control system. Object versions can be maintained at the Project, Layer, Stream, Design or Data Object level as the system supports XML exports at any of these levels. This facilitates promotion from DEV to TEST to PROD. An intuitive Import wizard allows selection of child objects to reuse, or rename if they already exist in target environments. Allows you to choose target-related connection information while importing. The Command Line Interface (CLI) supports import and export for automated change control and deployment processes. The Scheduler is an integrated UI which allows you to schedule execution of Data Streams and external programs or scripts, while the CLI gives you the flexibility to employ other enterprise scheduling tools such as AutoSys, Control-M or IBM TWS among others. 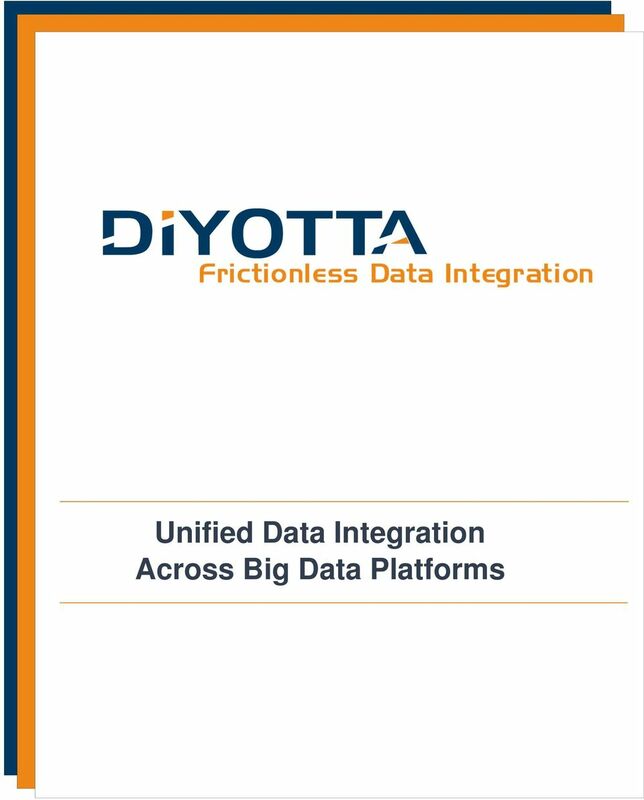 Benefits of the Diyotta Solution Conclusion The Diyotta Data Integration Suite is purpose-built on a standardized architecture with unified development and metadata to manage data integration across multiple big data platforms. 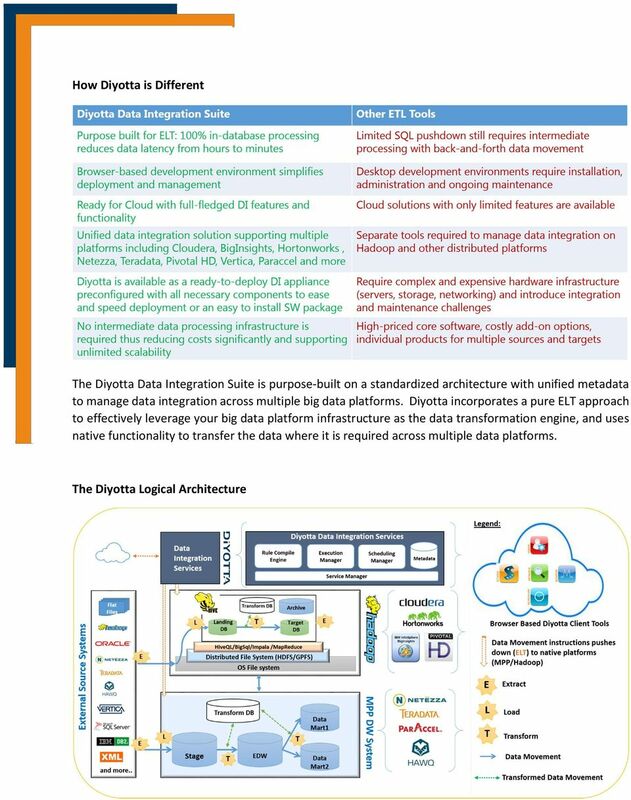 Diyotta incorporates a pure ELT approach to effectively leverage your big data platform infrastructure as the data transformation engine. 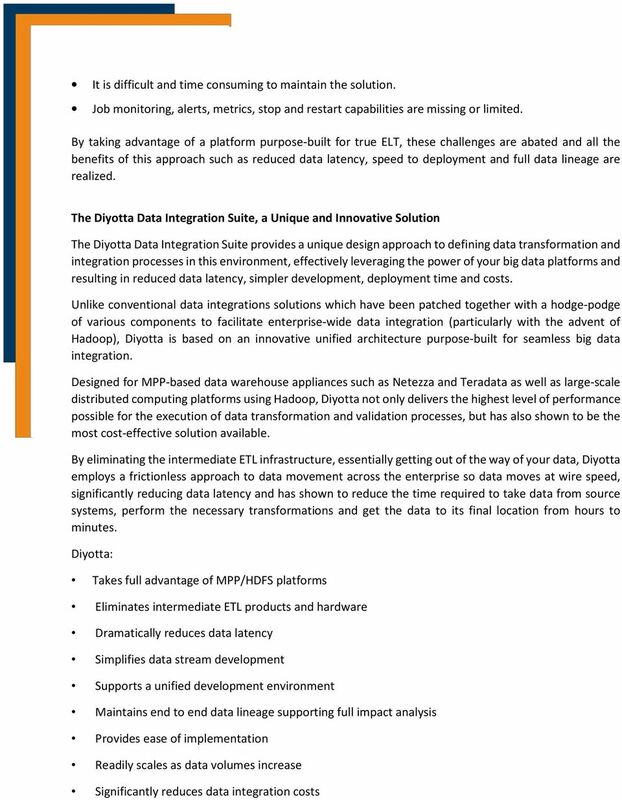 11 Diyotta eliminates the need for standalone ETL servers, instead fully leveraging the inherent power of parallel processing data engines. This provides the fastest movement of data in your environment, the highest performance in executing data transformations, and the lowest data latency possible. 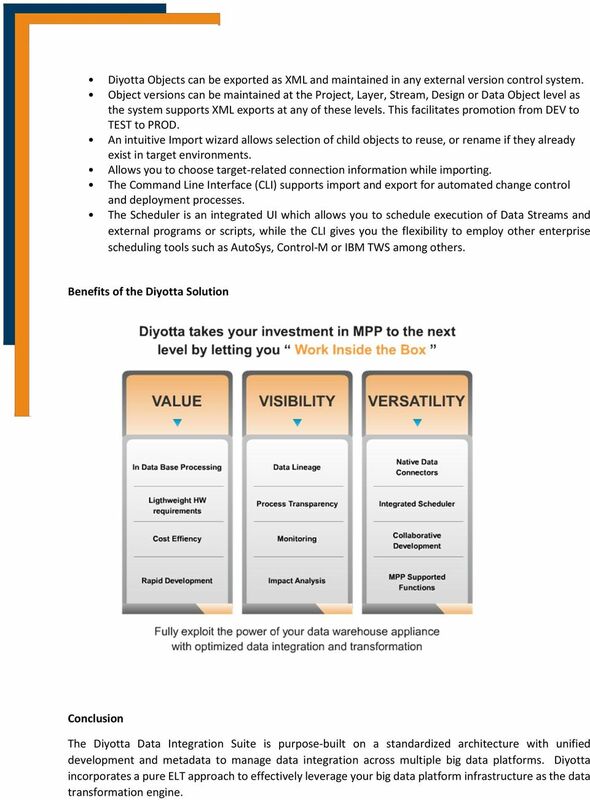 The Diyotta Suite is an intuitive, graphical, collaborative, and metadata-driven integrated development environment that increases productivity, reusability, and traceability of your data integration processes. End to end data lineage maintains the heritage and veracity of your data you know where it came from, what you did to it along the way, and where it ended up. This is key to regulatory compliance and impact analysis. 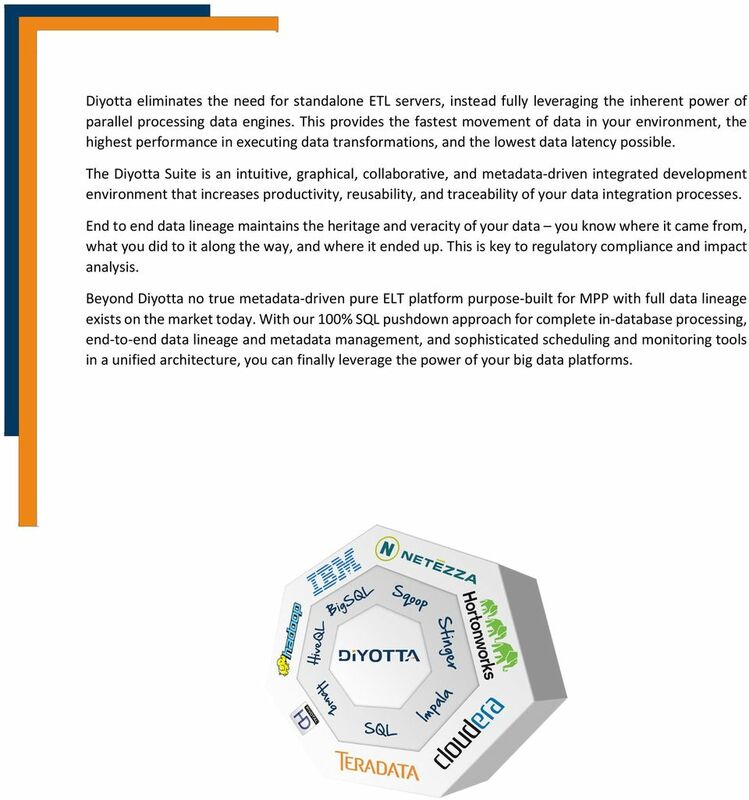 Beyond Diyotta no true metadata-driven pure ELT platform purpose-built for MPP with full data lineage exists on the market today. With our 100% SQL pushdown approach for complete in-database processing, end-to-end data lineage and metadata management, and sophisticated scheduling and monitoring tools in a unified architecture, you can finally leverage the power of your big data platforms.